I was going to write an article for Memorial Day, then decided that what I said last year still holds true - maybe even more so - today. German soldiers in Afghanistan - don't shoot the bad guys! 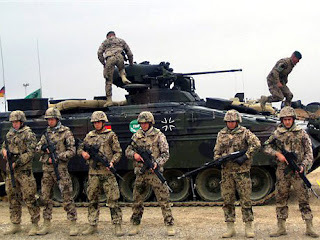 Germany, with great reluctance and with almost no popular support for anything that resembles helping their supposed American allies, has sent troops to Afghanistan as part of its NATO commitment. Recently, Germany's military operations in Afghanistan were highlighted when mounted an operation to capture a senior Taliban commander, one with British blood on his hands. The Germans got close, but when they were discovered and the Taliban leader slipped away, the German soldiers, part of an elite special operations unit (the Kommandos Spezialkräfte, or KSK) declined to open fire on the hostiles. It seems that the German rules of engagement do not allow combat forces in the field to use their weapons except in self defense. Politicians in Bonn and Berlin are placing tactical restrictions on what I am sure are fine troops. The official German statement (from Berlin, of course): "This incident will not change our policy of the 'principle of proportionality.' A fugitive like the Baghlan bomber is not an aggressor and should not be shot unless in self-defense." A senior Taliban commander with a documented history of killing British troops with roadside bombs is not an aggressor? What planet are you on? The British press was not impressed. Their headline: The Germans - armed but not very dangerous. 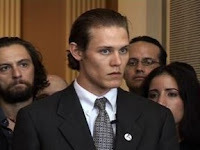 After a brief appearance in front of the partisan Congressional Progressive Caucus, U.S. Army Reserve Sergeant Matthis Chiroux openly declared that he intends to refuse a lawful order to deploy with his unit to Iraq in June. Chiroux will not be the first nor the last soldier (and I use the term loosely) to refuse to deploy to Iraq, usually on grounds that he considers it an illegal war. I have some news for the young sergeant - he does not get to pick and choose the wars in which he wants to serve. I remember a great line from the movie Crimson Tide - "We're here to defend democracy, not to practice it." "I stand before you today with the strength and clarity and resolve to declare to the military, my government and the world that this soldier will not be deploying to Iraq. My decision is based on my desire to no longer continue violating my core values to support an illegal and unconstitutional occupation. I refuse to participate in the Iraq occupation." "…I will support and defend the Constitution of the United States against all enemies, foreign or domestic...."
I took that same oath almost four decades ago. These are not mere words – they define who we are, they define the social contract between the armed forces and the people of the United States. In the ensuing decades, I was sent to wars, conflicts and “police actions” in Vietnam, Lebanon, Iraq, the Persian Gulf and Bosnia. Did I agree with all these operations or commitments? Maybe, maybe not – it did not matter. When you take the oath, you commit to defend the Constitution and obey the orders of those above you. Refuse to serve, pay the price. 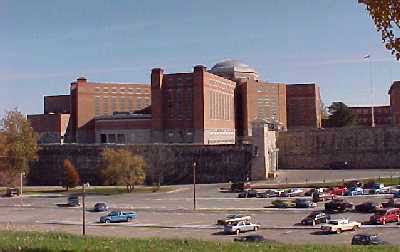 The photo above should be Chiroux's new home - the United States Disciplinary Barracks, Fort Leavenworth, Kansas. 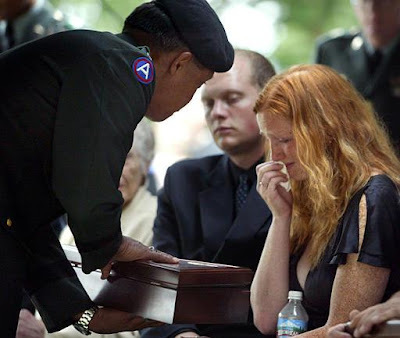 It is interesting that this declaration comes just before Memorial Day, when we honor our fallen comrades. It is insulting that we talk about a potential deserter at the same time. 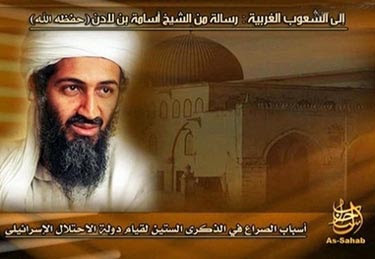 Photo - This is the screen displayed by Al-Sahab, al-Qa'idah video production organization during the play of the latest audiotape from Usamah bin Ladin. The text reads, "To the Arab people, a message from Shaykh Usamah bin Ladin (God keep him) - The reasons for the struggle on the 60th anniversary of the establishment of the Israeli occupation state." Over the years, the messages from bin Ladin have been addressed to various audiences and espouse various causes, depending on his current situation. His latest cause is very interesting - the plight of the Palestinian people. His claims that the goal of the al-Qa'idah organization is the liberation of Palestine, specifically the Gaza Strip. This is relatively new for bin Ladin, but makes a certain amount of sense. Given his failures to accomplish any of his goals in Afghanistan, Pakistan, Saudi Arabia or Iraq, he needs a new cause, a reason to continue his war with the west and to justify attacks on Arab governments he believes have been co-opted by the west (Egypt, Jordan and Iraq). That cause is the Palestinian people, and the liberation of Jerusalem, site of Islam's third holiest shrine - the al-Aqsa mosque. His failures have been underscored by his recent orders to his followers in the Kingdom of Saudi Arabia to leave and head for Yemen. Bin Ladin assessed - correctly - that the climate in Yemen is much more conducive venue to base his terrorist operatives. Since 2003, the Saudis have cracked down on al-Qa'idah operatives in the kingdom after some high-profile attacks on facilities of the Saudi government and on housing compounds of contractors serving the interests of the kingdom. See my earlier article, Yemen walking a fine line. Bin Ladin will find a willing ally in Hamas, which has virtually established an Islamic state in the Gaza Strip. Both Egypt and Israel have maintained a tight blockade on Gaza. That blockade erupted into a border crisis earlier this year, but the border has been re-established. Bin Ladin has found one cause that will not go away anytime soon. It's a smart move - he will be able to use this as his raison d’être for years to come. Yemen has finally imprisoned Jabr al-Banah, one of the FBI's Most Wanted Terrorists after months of allowing him to roam free unhindered in the country after not only escaping from prison, but appearing in court! It sounds unbelievable, but that is what happened. (See my earlier article, Yemen - State sponsor of terrorism? Why the sudden change of heart? In addition to pressure from the United States government for allowing a convicted terrorist (and American citizen - he has dual citizenship) to evade justice, Yemen has had some challenges of late. One of the more serious challenges (other than me calling them a state sponsor of terrorism) is the fact that earlier this month, Usamah bin Ladin ordered his al-Qa'idah operatives to leave the Kingdom of Saudi Arabia and head for Yemen. Bin Ladin assessed - correctly - that the climate in Yemen is much more conducive venue to base his terrorist operatives. Since 2003, the Saudis have cracked down on al-Qa'idah operatives in the kingdom after some high-profile attacks on facilities of the Saudi government and on housing compounds of contractors serving the interests of the kingdom. Although many of us in the intelligence business have often ridiculed Saudi external intelligence capabilities, we have all had a healthy respect for the extremely capable and often ruthless internal security apparatus. That apparatus has been systematically and effectively hunting down and killing al-Qai'dah terrorists to the point that bin Ladin decided it was no longer viable to operate in Saudi Arabia. The best option for al-Qa'idah was to move its operations base to Yemen, one of the poorest and most corrupt countries on the planet. What happens now? That remains to be seen. Will Yemen allow itself to become a new al-Qa'idah stronghold, or will Yemeni President 'Ali 'Abdullah Salih exercise some backbone and keep his commitments to the United States to be an ally in the war on terrorism. Putting al-Banah in jail is good signal to the United States. 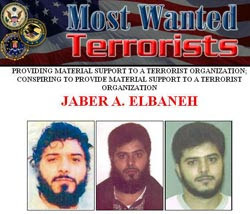 Although the United States would prefer that al-Banah be extradited to the United States to stand trial for his role as as one of the "Lackawanna Six" - a terrorist support cell operating in New York state, Yemeni law does not permit sending al-Banah out of the country. In the meantime, al-Banah has been sent to the same "maximum security" prison that he easily escaped from two years ago. Let's see if he stays there. This is a test for the Salih government. Although I was invited to this luncheon, I did not attend. In fact, I have never attended any of the Pentagon functions. I did participate in the conference calls. The Newsvine article that Mr. Linkins cites does not mention my name – Mr. Linkins must have assumed that all invitees attended. I would appreciate a clarification that I did not attend the luncheon. There is a series of "investigative journalism" stories about the contacts between the Pentagon and the media military analysts - do a Google news search on "rick francona" - or click here. I have already made my case - I was not paid by the Pentagon, nor was I influenced by their alleged attempts to shape the media. This story is particularly interesting. It is interesting because I was not at the december luncheon with then-Secretary of Defense Donald Rumsfeld. In fact, I have never met Rumsfeld, nor have I set foot in the Pentagon since I retired from the U.S. Air Force. Shocking excerpts of confidential recordings recently released under the Freedom of Information Act feature former Defense Secretary Donald Rumsfeld talking with top military analysts about how a flagging Neo-Con political agenda could be successfully restored with the aid of another terrorist attack on America. The tape also includes a conversation where Rumsfeld and the military analysts agree on the possible necessity of installing a brutal dictator in Iraq to oversee U.S. interests. The tapes were released as part of the investigation into the Pentagon’s "message force multipliers" program in which top military analysts were hired to propagandize for the Iraq war in the corporate media. In attendance at the valedictory luncheon Rumsfeld hosted on December 12, 2006 were David L. Grange, Donald W. Sheppard, James Marks, Rick Francona, Wayne Downing, and Robert H. Scales, Jr. among others. Peace between Syria and Israel? There have been recent reports that the Turks are brokering peace talks between Damascus and Tel Aviv, reports that have been confirmed by both sides. The timing of this is interesting, coming shortly after public disclosure of Syria’s attempts to develop fissile material with North Korean assistance at a facility in northwest Syria. The talks also come six months after Israeli aircraft destroyed that very facility. While Israel and Syria are the two principals who would sign any agreement, they are not the only players at the table. Talks between Damascus and Tel Aviv of necessity involve Lebanon, the Palestinians and most importantly, Iran. Iran remains the principal supporter of Lebanese and Palestinian “resistance” groups – Lebanese Hezbollah, Hamas and Islamic Jihad. Iranian support to these groups is dependent on Syrian cooperation, or at least Syrian acquiescence. Iran’s ability to use Syrian airspace and the international airport at Damascus provides the mechanism to funnel money, weapons and training to the Palestinian groups and Hezbollah. Iranian transport aircraft land at Damascus, equipment is offloaded and put on trucks for the short drive to the Lebanese border and the Bekaa Valley. Hezbollah fighters are transported from Lebanon to Damascus for the short flight to training camps in Iran. It is this air bridge that was used to build up the Hezbollah stronghold in southern Lebanon after the Israeli withdrawal in 2000 and again after the short war there in 2006. The support continues – Hezbollah claims that they not only have replenished the stockpiles of rockets used in 2006, but have acquired even more. Israel’s first condition for any agreement with Damascus will be cessation of Iranian use of Syrian territory to support these terrorist groups. 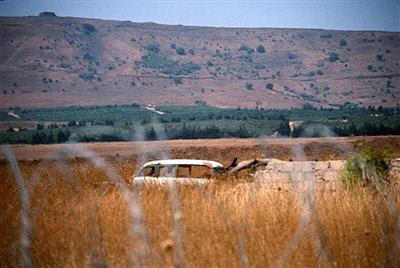 Syria’s demands will include the return of the Golan Heights, occupied by Israel since they were seized by Israeli troops in the 1967 war. At that time, the heights were used by Syrian artillery units to shell Israeli cities in the valleys below. In the intervening 40 years, however, Syria has acquired missile systems that negate the military value of the heights. Thus, Israel has no military reason for retaining the heights at the expense of a peace agreement with Syria, although there are valuable intelligence collection facilities overlooking southern Syria. There is also some concern in Israel about Syrian control of the headwaters of the Jordan River – Israel will likely ask for Syrian water guarantees. Israel has expressed a willingness to return the territory in return for a peace agreement. Would Syria break with its primary ally for the return of the Golan? Syria has major – probably overriding – national interests in Lebanon and must consider the impact of essentially cutting of Hezbollah from Iran. Without its leverage over Hezbollah, Syria may not have the ability to put pressure on present and future Lebanese governments to ensure it still has access to the powerhouse Lebanese economy. Israel has far more to gain than Syria at this moment. The status quo benefits Damascus much more than Tel Aviv. It probably appears to Syrian president Bashar al-Assad that he has the upper hand – Israel is facing a series of threats that weakens its bargaining position. Hezbollah has rearmed and is a formidable force on Israel’s northern border. Hamas continues confront Israel in the Gaza Strip and Islamic Jihad fires rockets into southern Israel from Gaza almost daily. Iran not only funnels weapons to all three groups, it is also is a present conventional threat and is a potential nuclear threat. The Israelis have claimed that Iran represents an “existential” threat to the Jewish state. For years, the Arabs adopted a unified strategy of a “just and comprehensive peace” in the region, trying to force Israel to deal with them as a bloc rather than one at a time. The Israelis successfully defeated that by first making a separate peace agreement with Egypt, then a short-lived agreement with Lebanon, then with Jordan, effectively isolating Syria as the lone holdout. Syria is the lone holdout, but with quite a bit of leverage. I doubt there will be any headway anytime soon. Israel is not going to start a war with Syria, and Syria does not need peace with Israel.